New listingA,. BOGUSLAVSKY 1925. (TURF). WINNERS ON THE TURF. 1 ODD CARD NUMBER 2. THIS LOT FOR AUCTION CONSISTS OF ONE CARD FROM A SET ISSUED BY BOGUSLAVSKY IN 1925 NUMBER 2. DESCRIBED AS BEING IN A GOOD TO VERY GOOD CONDITION, VERY HARD TO COME BY., BUT PLEASE DO CHECK OUT PHOTOS FOR YOURSELF , AS THIS IS THE CARD YOU WILL RECEIVE. THE CARD COMES LOOSE BUT HAS AN INDIVIDUAL SLEEVE.I AM DOWNSIZING MY COLLECTION,, AND THAT IS THE ONLY REASON FOR SELLING.I WILL COMBINE POSTAGE ON MULTIPLE BUYS. OGDENS, 1927. JOCKEYS. &. OWNERS COLOURS . ONE ODD CARDS NUMBER 24. THIS LOT FOR AUCTION CONSISTS OF ONE CARD FROM A SET ISSUED BY OGDENS IN 1927.. NUMBER 24. . DESCRIBED AS BEING IN A GOOD TO VERY GOOD CONDITION, BUT PLEASE DO CHECK OUT PHOTOS FOR YOURSELF , AS THIS IS THE CARD YOU WILL RECIEVE. SENT LOOSE BUT WITH INDIVIDUAL SLEEVES I AM DOWNSIZING MY COLLECTION,, AND THAT IS THE ONLY REASON FOR SELLING. I WILL COMBINE POSTAGE ON MULTIPLE BUYS. New listingJ. PLAYER. 1925. RACING CARICATURES . 1 ODD CARD . NUMBER 18. THIS LOT FOR AUCTION CONSISTS OF A SINGLE CARD FROM PLAYERS ISSUED 1926. ..RACING. CARICATURES. NUMBER 18. DESCRIBED AS BEING IN A GOOD TO VERY GOOD CONDITION . ,, BUT PLEASE DO CHECK OUT PHOTOS FOR YOURSELF , AS THIS IS THE CARD YOU WILL RECEIVE . CARD SENT LOOSE , BUT IN ITS OWN SLEEVE. I AM DOWNSIZING MY COLLECTION,, AND I AM SELLING OFF MY ODDS , AND ENDS SINGULARLY, TO HOPEFULLY MAKE IT EASIER FOR YOU TO GET WHAT YOU REQUIRE. I WILL COMBINE POSTAGE ON MULTIPLE BUYS. New listingJ. PLAYER. 1925. RACING CARICATURES . 1 ODD CARD . NUMBER 7. THIS LOT FOR AUCTION CONSISTS OF A SINGLE CARD FROM PLAYERS ISSUED 1926. ..RACING. CARICATURES. NUMBER 7.. DESCRIBED AS BEING IN A GOOD TO VERY GOOD CONDITION . ,, BUT PLEASE DO CHECK OUT PHOTOS FOR YOURSELF , AS THIS IS THE CARD YOU WILL RECEIVE . CARD SENT LOOSE , BUT IN ITS OWN SLEEVE. I AM DOWNSIZING MY COLLECTION,, AND I AM SELLING OFF MY ODDS , AND ENDS SINGULARLY, TO HOPEFULLY MAKE IT EASIER FOR YOU TO GET WHAT YOU REQUIRE. I WILL COMBINE POSTAGE ON MULTIPLE BUYS. New listingJ. PLAYER. 1925. RACING CARICATURES . 1 ODD CARD . NUMBER 13. THIS LOT FOR AUCTION CONSISTS OF A SINGLE CARD FROM PLAYERS ISSUED 1926. ..RACING. CARICATURES. NUMBER 13. DESCRIBED AS BEING IN A GOOD TO VERY GOOD CONDITION . ,, BUT PLEASE DO CHECK OUT PHOTOS FOR YOURSELF , AS THIS IS THE CARD YOU WILL RECEIVE . CARD SENT LOOSE , BUT IN ITS OWN SLEEVE. I AM DOWNSIZING MY COLLECTION,, AND I AM SELLING OFF MY ODDS , AND ENDS SINGULARLY, TO HOPEFULLY MAKE IT EASIER FOR YOU TO GET WHAT YOU REQUIRE. I WILL COMBINE POSTAGE ON MULTIPLE BUYS. New listingJ. PLAYER. 1925. RACING CARICATURES . 1 ODD CARD . NUMBER 16. THIS LOT FOR AUCTION CONSISTS OF A SINGLE CARD FROM PLAYERS ISSUED 1926. ..RACING. CARICATURES. NUMBER 16 DESCRIBED AS BEING IN A GOOD TO VERY GOOD CONDITION . ,, BUT PLEASE DO CHECK OUT PHOTOS FOR YOURSELF , AS THIS IS THE CARD YOU WILL RECEIVE . CARD SENT LOOSE , BUT IN ITS OWN SLEEVE. I AM DOWNSIZING MY COLLECTION,, AND I AM SELLING OFF MY ODDS , AND ENDS SINGULARLY, TO HOPEFULLY MAKE IT EASIER FOR YOU TO GET WHAT YOU REQUIRE. I WILL COMBINE POSTAGE ON MULTIPLE BUYS. New listingJ. PLAYER. 1925. RACING CARICATURES . 1 ODD CARD . NUMBER 17. THIS LOT FOR AUCTION CONSISTS OF A SINGLE CARD FROM PLAYERS ISSUED 1926. ..RACING. CARICATURES. NUMBER 17.. DESCRIBED AS BEING IN A GOOD TO VERY GOOD CONDITION . ,, BUT PLEASE DO CHECK OUT PHOTOS FOR YOURSELF , AS THIS IS THE CARD YOU WILL RECEIVE . CARD SENT LOOSE , BUT IN ITS OWN SLEEVE. I AM DOWNSIZING MY COLLECTION,, AND I AM SELLING OFF MY ODDS , AND ENDS SINGULARLY, TO HOPEFULLY MAKE IT EASIER FOR YOU TO GET WHAT YOU REQUIRE. I WILL COMBINE POSTAGE ON MULTIPLE BUYS. New listingJ. PLAYER. 1925. RACING CARICATURES . 1 ODD CARD . NUMBER 3. THIS LOT FOR AUCTION CONSISTS OF A SINGLE CARD FROM PLAYERS ISSUED 1926. ..RACING. CARICATURES. NUMBER 3. DESCRIBED AS BEING IN A GOOD TO VERY GOOD CONDITION . ,, BUT PLEASE DO CHECK OUT PHOTOS FOR YOURSELF , AS THIS IS THE CARD YOU WILL RECEIVE . CARD SENT LOOSE , BUT IN ITS OWN SLEEVE. I AM DOWNSIZING MY COLLECTION,, AND I AM SELLING OFF MY ODDS , AND ENDS SINGULARLY, TO HOPEFULLY MAKE IT EASIER FOR YOU TO GET WHAT YOU REQUIRE. I WILL COMBINE POSTAGE ON MULTIPLE BUYS. New listingJ. PLAYER. 1925. RACING CARICATURES . 1 ODD CARD . NUMBER 22. THIS LOT FOR AUCTION CONSISTS OF A SINGLE CARD FROM PLAYERS ISSUED 1926. ..RACING. CARICATURES. NUMBER 22... DESCRIBED AS BEING IN A GOOD TO VERY GOOD CONDITION . ,, BUT PLEASE DO CHECK OUT PHOTOS FOR YOURSELF , AS THIS IS THE CARD YOU WILL RECEIVE . CARD SENT LOOSE , BUT IN ITS OWN SLEEVE. I AM DOWNSIZING MY COLLECTION,, AND I AM SELLING OFF MY ODDS , AND ENDS SINGULARLY, TO HOPEFULLY MAKE IT EASIER FOR YOU TO GET WHAT YOU REQUIRE. I WILL COMBINE POSTAGE ON MULTIPLE BUYS. New listingJ. PLAYER. 1925. RACING CARICATURES . 1 ODD CARD . NUMBER 38. THIS LOT FOR AUCTION CONSISTS OF A SINGLE CARD FROM PLAYERS ISSUED 1926. ..RACING. CARICATURES. NUMBER 38. DESCRIBED AS BEING IN A GOOD TO VERY GOOD CONDITION . ,, BUT PLEASE DO CHECK OUT PHOTOS FOR YOURSELF , AS THIS IS THE CARD YOU WILL RECEIVE . CARD SENT LOOSE , BUT IN ITS OWN SLEEVE. I AM DOWNSIZING MY COLLECTION,, AND I AM SELLING OFF MY ODDS , AND ENDS SINGULARLY, TO HOPEFULLY MAKE IT EASIER FOR YOU TO GET WHAT YOU REQUIRE. I WILL COMBINE POSTAGE ON MULTIPLE BUYS. OGDENS, 1906. OWNERS RACING COLOURS & JOCKEYS .BLUE BACK. RARE CARD. NO 49. THIS LOT FOR AUCTION CONSISTS OF ONE CARDS FROM A SET ISSUED BY OGDENS IN 1906 NUMBER. 49.DESCRIBED AS BEING IN A VERY GOOD CONDITION, BUT PLEASE DO CHECK OUT PHOTOS FOR YOURSELF , AS THIS IS THE CARD YOU WILL RECEIVE. IT IS LOOSE BUT HAS AN INDIVIDUAL SLEEVEI AM DOWNSIZING MY COLLECTION,, AND THAT IS THE ONLY REASON FOR SELLING.I WILL COMBINE POSTAGE ON MULTIPLE BUYS. OGDENS, 1930. JOCKEYS 1930. . RARE CARD. NUMBER 45. OGDENS, RACEHORSES . 1907.. . 1 ODD CARD NUMBER 32. VERY HARD TO FIND. THIS LOT FOR AUCTION CONSISTS OF ONE CARD FROM A SET ISSUED BY OGDENS IN 1907. RACEHORSES. NUMBER 32...VERY HARD TO FIND. DESCRIBED AS BEING IN A VERY GOOD CONDITION, AND A GOOD PRICE FOR RARE CARD.,BUT PLEASE DO CHECK OUT PHOTOS FOR YOURSELF , AS THIS IS ARE THE CARD YOU WILL RECEIVE. THE CARD COMES LOOSE BUT IN INDIVIDUAL SLEEVE. I AM DOWNSIZING MY COLLECTION,, AND THAT IS THE ONLY REASON FOR SELLING. I WILL COMBINE POSTAGE ON MULTIPLE BUYS. OGDENS, RACEHORSES . 1907.. . 1 ODD CARD NUMBER 28, VERY HARD TO FIND. THIS LOT FOR AUCTION CONSISTS OF ONE CARD FROM A SET ISSUED BY OGDENS IN 1907. RACEHORSES. NUMBER 28....VERY HARD TO FIND. DESCRIBED AS BEING IN A VERY GOOD CONDITION, AND A GOOD PRICE FOR RARE CARD.,BUT PLEASE DO CHECK OUT PHOTOS FOR YOURSELF , AS THIS IS ARE THE CARD YOU WILL RECEIVE. THE CARD COMES LOOSE BUT IN INDIVIDUAL SLEEVE. I AM DOWNSIZING MY COLLECTION,, AND THAT IS THE ONLY REASON FOR SELLING. I WILL COMBINE POSTAGE ON MULTIPLE BUYS. OGDENS, RACEHORSES . 1907.. . 1 ODD CARD NUMBER 46. VERY HARD TO FIND. THIS LOT FOR AUCTION CONSISTS OF ONE CARD FROM A SET ISSUED BY OGDENS IN 1907. RACEHORSES. NUMBER 46 ..VERY HARD TO FIND. DESCRIBED AS BEING IN A VERY GOOD CONDITION, AND A GOOD PRICE FOR RARE CARD.,BUT PLEASE DO CHECK OUT PHOTOS FOR YOURSELF , AS THIS IS ARE THE CARD YOU WILL RECEIVE. THE CARD COMES LOOSE BUT IN INDIVIDUAL SLEEVE. I AM DOWNSIZING MY COLLECTION,, AND THAT IS THE ONLY REASON FOR SELLING. I WILL COMBINE POSTAGE ON MULTIPLE BUYS. OGDENS, RACEHORSES . 1907.. . 1 ODD CARD NUMBER 31. VERY HARD TO FIND. THIS LOT FOR AUCTION CONSISTS OF ONE CARD FROM A SET ISSUED BY OGDENS IN 1907. RACEHORSES. NUMBER 31...VERY HARD TO FIND. DESCRIBED AS BEING IN A VERY GOOD CONDITION, AND A GOOD PRICE FOR RARE CARD.,BUT PLEASE DO CHECK OUT PHOTOS FOR YOURSELF , AS THIS IS ARE THE CARD YOU WILL RECEIVE. THE CARD COMES LOOSE BUT IN INDIVIDUAL SLEEVE. I AM DOWNSIZING MY COLLECTION,, AND THAT IS THE ONLY REASON FOR SELLING. I WILL COMBINE POSTAGE ON MULTIPLE BUYS. OGDENS, RACEHORSES . 1907.. . 1 ODD CARD NUMBER 40. VERY HARD TO FIND. THIS LOT FOR AUCTION CONSISTS OF ONE CARD FROM A SET ISSUED BY OGDENS IN 1907. RACEHORSES. NUMBER 40...VERY HARD TO FIND. DESCRIBED AS BEING IN A VERY GOOD CONDITION, AND A GOOD PRICE FOR RARE CARD.,BUT PLEASE DO CHECK OUT PHOTOS FOR YOURSELF , AS THIS IS ARE THE CARD YOU WILL RECEIVE. THE CARD COMES LOOSE BUT IN INDIVIDUAL SLEEVE. I AM DOWNSIZING MY COLLECTION,, AND THAT IS THE ONLY REASON FOR SELLING. I WILL COMBINE POSTAGE ON MULTIPLE BUYS. OGDENS, RACEHORSES . 1907.. . 1 ODD CARD NUMBER 45. VERY HARD TO FIND. THIS LOT FOR AUCTION CONSISTS OF ONE CARD FROM A SET ISSUED BY OGDENS IN 1907. RACEHORSES. NUMBER 45...VERY HARD TO FIND. DESCRIBED AS BEING IN A VERY GOOD CONDITION, AND A GOOD PRICE FOR RARE CARD.,BUT PLEASE DO CHECK OUT PHOTOS FOR YOURSELF , AS THIS IS ARE THE CARD YOU WILL RECEIVE. THE CARD COMES LOOSE BUT IN INDIVIDUAL SLEEVE. I AM DOWNSIZING MY COLLECTION,, AND THAT IS THE ONLY REASON FOR SELLING. I WILL COMBINE POSTAGE ON MULTIPLE BUYS. OGDENS, RACEHORSES . 1907.. . 1 ODD CARD NUMBER 36. VERY HARD TO FIND. THIS LOT FOR AUCTION CONSISTS OF ONE CARD FROM A SET ISSUED BY OGDENS IN 1907. RACEHORSES. NUMBER 36...VERY HARD TO FIND. DESCRIBED AS BEING IN A VERY GOOD CONDITION, AND A GOOD PRICE FOR RARE CARD.,BUT PLEASE DO CHECK OUT PHOTOS FOR YOURSELF , AS THIS IS ARE THE CARD YOU WILL RECEIVE. THE CARD COMES LOOSE BUT IN INDIVIDUAL SLEEVE. I AM DOWNSIZING MY COLLECTION,, AND THAT IS THE ONLY REASON FOR SELLING. I WILL COMBINE POSTAGE ON MULTIPLE BUYS. OGDENS, RACEHORSES . 1907.. . 1 ODD CARD NUMBER 34. VERY HARD TO FIND. THIS LOT FOR AUCTION CONSISTS OF ONE CARD FROM A SET ISSUED BY OGDENS IN 1907. RACEHORSES. NUMBER 34...VERY HARD TO FIND. DESCRIBED AS BEING IN A VERY GOOD CONDITION, AND A GOOD PRICE FOR RARE CARD.,BUT PLEASE DO CHECK OUT PHOTOS FOR YOURSELF , AS THIS IS ARE THE CARD YOU WILL RECEIVE. THE CARD COMES LOOSE BUT IN INDIVIDUAL SLEEVE. I AM DOWNSIZING MY COLLECTION,, AND THAT IS THE ONLY REASON FOR SELLING. I WILL COMBINE POSTAGE ON MULTIPLE BUYS. OGDENS, RACEHORSES . 1907.. . 1 ODD CARD NUMBER 47. VERY HARD TO FIND. THIS LOT FOR AUCTION CONSISTS OF ONE CARD FROM A SET ISSUED BY OGDENS IN 1907. RACEHORSES. NUMBER 47...VERY HARD TO FIND. DESCRIBED AS BEING IN A VERY GOOD CONDITION, AND A GOOD PRICE FOR RARE CARD.,BUT PLEASE DO CHECK OUT PHOTOS FOR YOURSELF , AS THIS IS ARE THE CARD YOU WILL RECEIVE. THE CARD COMES LOOSE BUT IN INDIVIDUAL SLEEVE. I AM DOWNSIZING MY COLLECTION,, AND THAT IS THE ONLY REASON FOR SELLING. I WILL COMBINE POSTAGE ON MULTIPLE BUYS. OGDENS, RACEHORSES . 1907.. . 1 ODD CARD NUMBER 35. VERY HARD TO FIND. 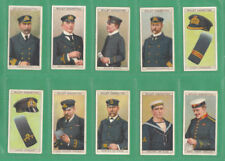 THIS LOT FOR AUCTION CONSISTS OF ONE CARD FROM A SET ISSUED BY OGDENS IN 1907. RACEHORSES. NUMBER 35..VERY HARD TO FIND. DESCRIBED AS BEING IN A VERY GOOD CONDITION, AND A GOOD PRICE FOR RARE CARD.,BUT PLEASE DO CHECK OUT PHOTOS FOR YOURSELF , AS THIS IS ARE THE CARD YOU WILL RECEIVE. THE CARD COMES LOOSE BUT IN INDIVIDUAL SLEEVE. I AM DOWNSIZING MY COLLECTION,, AND THAT IS THE ONLY REASON FOR SELLING. I WILL COMBINE POSTAGE ON MULTIPLE BUYS. OGDENS, RACEHORSES . 1907.. . 1 ODD CARD NUMBER 37. VERY HARD TO FIND. THIS LOT FOR AUCTION CONSISTS OF ONE CARD FROM A SET ISSUED BY OGDENS IN 1907. RACEHORSES. NUMBER 37 ..VERY HARD TO FIND. DESCRIBED AS BEING IN A VERY GOOD CONDITION, AND A GOOD PRICE FOR RARE CARD.,BUT PLEASE DO CHECK OUT PHOTOS FOR YOURSELF , AS THIS IS ARE THE CARD YOU WILL RECEIVE. THE CARD COMES LOOSE BUT IN INDIVIDUAL SLEEVE. I AM DOWNSIZING MY COLLECTION,, AND THAT IS THE ONLY REASON FOR SELLING. I WILL COMBINE POSTAGE ON MULTIPLE BUYS. W. & F. FAULKNER 1923. PROMINENT RACEHORSES OF THE PRESENT DAY. CARD NO. 3. THIS LOT FOR AUCTION CONSISTS OF ONE CARD FROM A SET ISSUED BY FAULKNER'S IN 1923. RARE CARD NUMBER 3. DESCRIBED AS BEING IN A GOOD TO VERY CONDITION, RARE CARD ,BUT PLEASE DO CHECK OUT PHOTOS FOR YOURSELF , AS THIS IS THE CARD YOU WILL RECEIVE. THE CARD COMES LOOSE BUT IN INDIVIDUAL SLEEVES.I AM DOWNSIZING MY COLLECTION,, AND THAT IS THE ONLY REASON FOR SELLING.I WILL COMBINE POSTAGE ON MULTIPLE BUYS. W. & F. FAULKNER 1923. PROMINENT RACEHORSES OF THE PRESENT DAY. CARD NO.19. 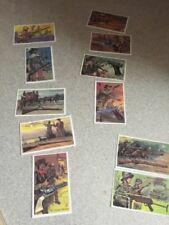 THIS LOT FOR AUCTION CONSISTS OF ONE CARD FROM A SET ISSUED BY FAULKNER'S IN 1923. RARE CARD . NUMBER 19., .DESCRIBED AS BEING IN A GOOD TO VERY CONDITION, RARE CARD ,BUT PLEASE DO CHECK OUT PHOTOS FOR YOURSELF , AS THIS IS THE CARD YOU WILL RECEIVE. THE CARD COMES LOOSE BUT IN INDIVIDUAL SLEEVES.I AM DOWNSIZING MY COLLECTION,, AND THAT IS THE ONLY REASON FOR SELLING.I WILL COMBINE POSTAGE ON MULTIPLE BUYS. W.&F. 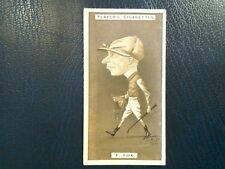 FAULKNER1924.PROMINENT RACEHORSES OF THE PRESENT DAY 2ND SERIES CARD NO50. OGDENS, 1930. JOCKEYS 1930. . RARE CARD. NUMBER 3. 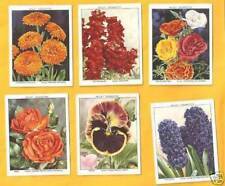 THIS LOT FOR AUCTION CONSISTS OF ONE CARDS FROM A SET ISSUED BY OGDENS IN 1930. JOCKEYS 1930. NUMBER. 3. VERY RARE. DESCRIBED AS BEING IN A GOOD TO VERY GOOD CONDITION, BUT PLEASE DO CHECK OUT PHOTOS FOR YOURSELF , AS THIS IS THE CARD YOU WILL RECEIVE. IT IS LOOSE BUT HAS AN INDIVIDUAL SLEEVE I AM DOWNSIZING MY COLLECTION,, AND THAT IS THE ONLY REASON FOR SELLING. I WILL COMBINE POSTAGE ON MULTIPLE BUYS. OGDENS, 1930. JOCKEYS 1930. . RARE CARD. NUMBER 17. OGDENS, 1930. JOCKEYS 1930. . RARE CARD. NUMBER 46. OGDENS, 1930. JOCKEYS 1930. . RARE CARD. NUMBER 12. OGDENS, 1930. 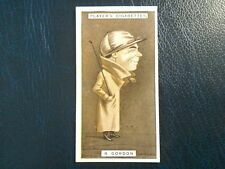 JOCKEYS 1930. . RARE CARD. NUMBER 41. OGDENS, 1930. JOCKEYS 1930. . RARE CARD. NUMBER 42. OGDENS, 1930. JOCKEYS 1930. . RARE CARD. NUMBER 8. OGDENS, 1930. JOCKEYS 1930. . RARE CARD. NUMBER 15. OGDENS, 1930. 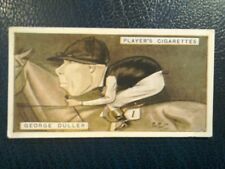 JOCKEYS 1930. . RARE CARD. NUMBER 6. OGDENS, 1930. JOCKEYS 1930. . RARE CARD. NUMBER 43. OGDENS, 1930. JOCKEYS 1930. . RARE CARD. NUMBER 39. OGDENS, 1930. JOCKEYS 1930. . RARE CARD. NUMBER 18. OGDENS, 1930. JOCKEYS 1930. . RARE CARD. NUMBER 21. OGDENS, 1930. 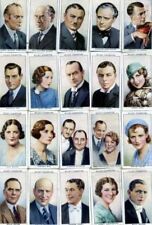 JOCKEYS 1930. . RARE CARD. NUMBER 4. OGDENS, 1927. JOCKEYS. &. OWNERS COLOURS . ONE ODD CARDS NUMBER 6. THIS LOT FOR AUCTION CONSISTS OF ONE CARD FROM A SET ISSUED BY OGDENS IN 1927.. NUMBER 6. DESCRIBED AS BEING IN A GOOD TO VERY GOOD CONDITION, BUT PLEASE DO CHECK OUT PHOTOS FOR YOURSELF , AS THIS IS THE CARD YOU WILL RECIEVE. SENT LOOSE BUT WITH INDIVIDUAL SLEEVES I AM DOWNSIZING MY COLLECTION,, AND THAT IS THE ONLY REASON FOR SELLING. I WILL COMBINE POSTAGE ON MULTIPLE BUYS. OGDENS, 1927. JOCKEYS. &. OWNERS COLOURS . ONE ODD CARDS NUMBER 7. THIS LOT FOR AUCTION CONSISTS OF ONE CARD FROM A SET ISSUED BY OGDENS IN 1927.. NUMBER 7. DESCRIBED AS BEING IN A GOOD TO VERY GOOD CONDITION, BUT PLEASE DO CHECK OUT PHOTOS FOR YOURSELF , AS THIS IS THE CARD YOU WILL RECIEVE. SENT LOOSE BUT WITH INDIVIDUAL SLEEVES I AM DOWNSIZING MY COLLECTION,, AND THAT IS THE ONLY REASON FOR SELLING. I WILL COMBINE POSTAGE ON MULTIPLE BUYS. OGDENS, 1927. JOCKEYS. &. OWNERS COLOURS . ONE ODD CARDS NUMBER 41. THIS LOT FOR AUCTION CONSISTS OF ONE CARD FROM A SET ISSUED BY OGDENS IN 1927.. NUMBER 41. DESCRIBED AS BEING IN A GOOD TO VERY GOOD CONDITION, BUT PLEASE DO CHECK OUT PHOTOS FOR YOURSELF , AS THIS IS THE CARD YOU WILL RECIEVE. SENT LOOSE BUT WITH INDIVIDUAL SLEEVESI AM DOWNSIZING MY COLLECTION,, AND THAT IS THE ONLY REASON FOR SELLING.I WILL COMBINE POSTAGE ON MULTIPLE BUYS. OGDENS, 1927. JOCKEYS. &. OWNERS COLOURS . ONE ODD CARDS NUMBER 3. THIS LOT FOR AUCTION CONSISTS OF ONE CARD FROM A SET ISSUED BY OGDENS IN 1927.. NUMBER 3. DESCRIBED AS BEING IN A GOOD TO VERY GOOD CONDITION, BUT PLEASE DO CHECK OUT PHOTOS FOR YOURSELF , AS THIS IS THE CARD YOU WILL RECIEVE. SENT LOOSE BUT WITH INDIVIDUAL SLEEVES I AM DOWNSIZING MY COLLECTION,, AND THAT IS THE ONLY REASON FOR SELLING. I WILL COMBINE POSTAGE ON MULTIPLE BUYS. OGDENS, 1927. JOCKEYS. &. OWNERS COLOURS . ONE ODD CARDS NUMBER 35. THIS LOT FOR AUCTION CONSISTS OF ONE CARD FROM A SET ISSUED BY OGDENS IN 1927.. NUMBER 35. . DESCRIBED AS BEING IN A GOOD TO VERY GOOD CONDITION, BUT PLEASE DO CHECK OUT PHOTOS FOR YOURSELF , AS THIS IS THE CARD YOU WILL RECIEVE. SENT LOOSE BUT WITH INDIVIDUAL SLEEVES I AM DOWNSIZING MY COLLECTION,, AND THAT IS THE ONLY REASON FOR SELLING. I WILL COMBINE POSTAGE ON MULTIPLE BUYS. OGDENS, 1927. JOCKEYS. &. OWNERS COLOURS . ONE ODD CARDS NUMBER 33. THIS LOT FOR AUCTION CONSISTS OF ONE CARD FROM A SET ISSUED BY OGDENS IN 1927.. NUMBER 33. . DESCRIBED AS BEING IN A GOOD TO VERY GOOD CONDITION, BUT PLEASE DO CHECK OUT PHOTOS FOR YOURSELF , AS THIS IS THE CARD YOU WILL RECIEVE. SENT LOOSE BUT WITH INDIVIDUAL SLEEVES I AM DOWNSIZING MY COLLECTION,, AND THAT IS THE ONLY REASON FOR SELLING. I WILL COMBINE POSTAGE ON MULTIPLE BUYS. OGDENS, 1927. JOCKEYS. &. OWNERS COLOURS . ONE ODD CARDS NUMBER 37. THIS LOT FOR AUCTION CONSISTS OF ONE CARD FROM A SET ISSUED BY OGDENS IN 1927.. NUMBER 37. DESCRIBED AS BEING IN A GOOD TO VERY GOOD CONDITION, BUT PLEASE DO CHECK OUT PHOTOS FOR YOURSELF , AS THIS IS THE CARD YOU WILL RECIEVE. SENT LOOSE BUT WITH INDIVIDUAL SLEEVES I AM DOWNSIZING MY COLLECTION,, AND THAT IS THE ONLY REASON FOR SELLING. I WILL COMBINE POSTAGE ON MULTIPLE BUYS. J. PLAYER. 1925. RACING CARICATURES . 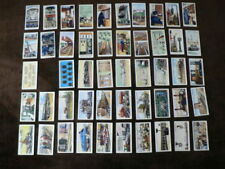 FULL SET OF 40 CARDS. OGDENS, 1901. TAB CIGARETTES . GENRAL INTEREST 'B' SERIES, CARDS. 2. OGDENS, DERBY. ENTRANTS. 1926. . 6. ODD CARDS NUMBERS 4-6-8-10-14-15.